Finnmark is the largest and most northerly county in Norway, and also the newest in the country. The borders with Sweden, Finland and Russia were not drawn until after 1750. Long fjords and large inland plains dominate the landscape. 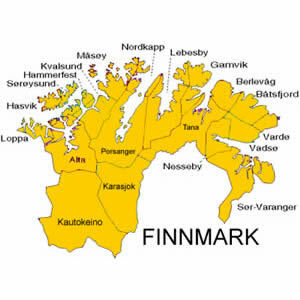 The name Finnmark means the land of the Sami and still holds true today as a majority of the Sami people live in this county. Stone age settlements as old as ten thousand years have been found in Finnmark. Vadsø is the capital and is the largest town, with a population of 6,186.